Melatonin Supplements - What do they actually do? Benefits of melatonin supplements – Sleep! Benefits of melatonin supplements – Beyond sleep! How should I take melatonin supplements? You probably know melatonin as the sleep hormone. You may also know that it is linked to the (perceived) drowsiness of a large turkey dinner because melatonin is made from the amino acid tryptophan, of which turkey is one of the best sources. (But it’s more likely the very large meal that makes you sleepy, rather than the turkey). Melatonin is actually a neurohormone secreted by the pineal gland in the brain, and it signals to the brain that it’s time to go to sleep. The body naturally releases this hormone when it thinks it actually is time to go to sleep, i.e. when the sun goes down. So, when the brain detects, through the eyes, that the sun is going down, the pineal gland secretes melatonin. This happens because of the “blue light effect”, which essentially means that when your eyes see blue-violet light, they think that it’s day time and that you need to be awake and alert. This blue light stops production of melatonin. Over the course of the evening, as the eyes are exposed to less blue-violet light and more red-amber light (think sunset colours), melatonin is produced and released to start getting you drowsy. You can imagine that this can easily be overridden by exposure to artificial light! In fact, artificial light at night has been associated with health concerns including cancer, particularly breast cancer. (1) Crazy, hey? NOTE from Leesa: I’ve linked the f.lux app as well as a few other products that can help with this in the “Resources” section below. 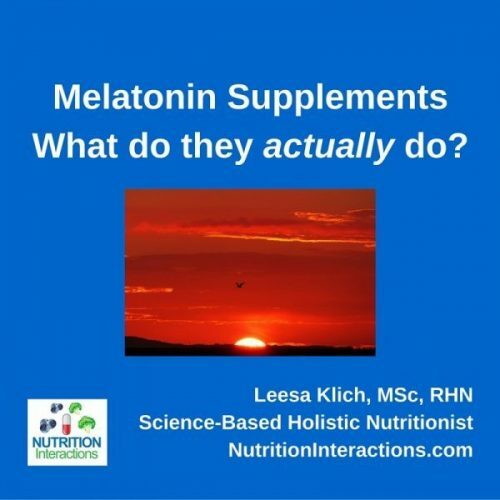 Even though melatonin is naturally produced in the brain (and a few other places in the body), ingesting or taking a melatonin supplement sublingually (under the tongue) can also produce the same results. NOTE from Leesa: This is NOT the case with all compounds naturally produced in the body – think insulin for example; consuming insulin will not have the same effect as when it’s produced by the pancreas, or injected directly into the bloodstream. Mode of entry into the body can be a huge factor in terms of effectiveness. Despite all of melatonin’s benefits, melatonin supplements have one of the largest numbers of labelled cautions and warnings, so they’re definitely NOT for everyone (see below)! Let’s not underestimate the many health benefits to getting enough good quality sleep. Improvements in mood and memory, and even lower risks of several diseases are most likely because of improved sleep (and not melatonin). Melatonin supplements have proven to reduce insomnia, and are often used to help re-establish sleep patterns for people who do shift work, or are jet lagged. Not only can it help you get drowsy & fall sleep, but it has also been shown to improve sleep duration and quality. Melatonin has also been shown to have some other health effects beyond sleep. One example is its antioxidant and anti-inflammatory properties. Melatonin supplements can reduce exercise-induced oxidation as well as inflammatory cytokines. In fact, according to one test tube study(4), melatonin was a better antioxidant than vitamin C, resveratrol (in red wine), EGCG (in green tea), and alpha-lipoic acid (in vegetables). It can also be beneficial for several gut issues such as heartburn, reflux and even ulcers. Melatonin is currently being studied to look at its potential to help reduce mortality in people with certain types of cancers. (3) NOT as a replacement for medical treatment, but in addition to it. Another great benefit of melatonin supplements is that they do not appear to induce tolerance (needing higher and higher doses to get the same effect) or addiction (inability to discontinue without horrible side effects); nor do they seem to cause a negative feedback loop with the natural production of melatonin. Many hormone-type medications, such as corticosteroids for example, tend to trigger the body to produce less and less of that hormone because it recognizes that it’s not needed (because you’re supplying it separately). This is the “negative feedback loop” that seems to not apply to melatonin supplements. Finally (I may have saved the best for last), melatonin can help you live longer! DISCLAIMER from Leesa: Many of the benefits of melatonin supplementation listed above, especially the non-sleep related ones, have not been studied enough, are not widely recognized, nor are “approved” uses for melatonin supplements – I recommend you follow the directions for use on your supplement’s label, or speak with your healthcare professional. Beyond that, there are a few other things to consider. NOTE from Leesa: If you have experienced an adverse event related to your use of a melatonin (or any) supplement, AND you’re in Canada or the USA, you can report them directly to the health authorities at the links below. Health Canada’s MedEffect link is reference (8), and the FDA’s MedWatch link is reference (9). If you’re already doing great work in addressing diet and lifestyle to help your sleep cycle,(2) you might consider melatonin supplements. The interesting thing about supplementing with melatonin is that it appears that lower doses are actually more effective than higher doses. Most of the information I’ve seen shows that 5-10 mg (or less) works as well or better than any doses over 10 mg (so don’t waste your money by doubling-up!). To help you go to sleep, melatonin should be taken once per day at bedtime. Also, these supplements are recommendations for adults, not children (if you want to try it with your child, then do it under medical supervision only). Examine.com is an independent encyclopedia on supplementation and nutrition. 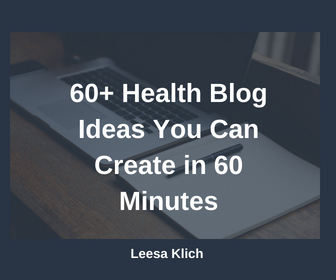 Awesome post, Leesa! I love all of the evidence.